Diane Blum is Senior Vice President of the National Executive Service Corps, which helps small nonprofit healthcare organizations improve their capacity and outreach. She lives in New York City and is certified in social work. She serves as a member of ABIM’s Hematology Board. I served on the Institute of Medicine committee that produced the report, Psychosocial Care for the Whole Patient, which established guidelines and measures that mandate assessment of the psychosocial needs of people with cancer. I have worked in oncology and hematology for many years and this was at last a validation of the need to recognize and address the crucial concerns of the patient and family. I am always struck by the degree to which patients can live their lives even while being treated aggressively for cancer. These days, I see patients who are in active cancer treatment. Working, caring for their families and participating in physical activities are all things that I recognize as a change from when being treated for cancer was a full-time job that precluded all other activities. Patients say that living their lives “normally” is the most important thing to them, and advances in symptom management have made this possible for more people. The reason I wanted to serve on the ABIM Hematology Board is because I have an interest in what physicians learn in training and how they communicate with patients about all aspects of care – from treatment choice, to clinical trials, to end-of-life decisions. I believe curriculum that teaches the importance of the patient voice is crucial to insuring patient-centric care. What didn’t you know before joining the Hematology Board? ABIM has so many collaborative relationships with other organizations. 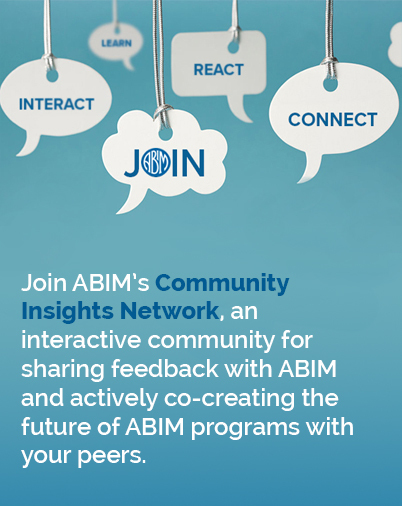 What did you learn about ABIM after joining the Hematology Board? After joining, I learned the depth and breadth of ABIM activities and the research that has been conducted about medical training and practice. I’ve met many wonderful committee members who share my commitment to patient-centric care and who want to ensure that patients with hematological diagnoses get the best quality care from physicians who have the knowledge and skills to provide it in the current healthcare environment. The biggest challenge has been trying to understand the changes that have happened rapidly at ABIM in the past two years. However, I would encourage others to join ABIM governance because it is a chance to have real impact on patient care through the training and ongoing learning of physicians. What’s something your colleagues may not know about you? Early in my career, I worked as a clinical social worker in oncology inpatient and outpatient units and I continue to be very committed to what I learned in social work graduate school, which is “always start where your client is.” It’s a good reminder for anyone working in health care. Aside from medicine, I am also interested in travel, politics, hiking and reading fiction.